The president made the remarks during an ITV interview with Piers Morgan. President Donald Trump has been called lots of things -- but what's his take on being described as a "sexist, misogynist pig?" In an interview with Piers Morgan on Britain's ITV, airing Sunday, the president was asked just that by the former CNN host, and responded, "Well, I am for them, and I think a lot of them understand that." Morgan also asked Trump, the father of daughters Ivanka, 36, and Tiffany, 24, "Do you identify as a feminist?" Morgan is an editor-at-large at the Daily Mail, which published on Saturday excerpts of the interview in an article penned by Morgan. (Olivier Douliery/Abaca Press/Sipa USA via AP) Tiffany Trump (L) and Ivanka Trump (R) share a laugh during the National Thanksgiving Turkey ceremony in the Rose Garden of the White House November 21, 2017 in Washington, DC. Trump also recalled his election campaign, telling Morgan, "You know, I won many categories of women and the women vote in the election, and people were shocked to see it. I was running against a woman and I’m winning all of these categories. And I think I would do even better right now." The president boasted of the progress American women are making with him in the Oval Office. "Women have the best unemployment numbers that they’ve had in 17 years," he said. "And they’re doing tremendously in business, they’re doing tremendously in so many ways. And people are starting to see that." 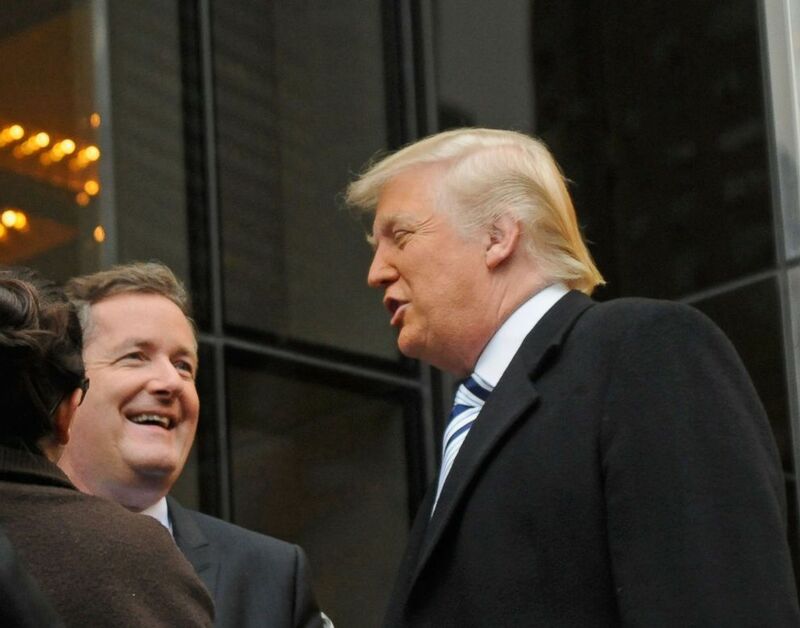 (Bobby Bank/WireImage) Donald Trump and Piers Morgan filming on location for 'The Celebrity Apprentice All Stars' on October 26, 2012 in New York City. Morgan asked Trump about his thoughts of gender equality and a woman's right to feel safe in the workplace, to which he said he does subscribe to. "I also think they want to feel safe at the border. I think they want to see our military get much stronger. Women want to see ... a strong law enforcement. I’m very much a law-and-order person. There’s nobody better than me on the military. I think women really like that. I think they want to be safe at home, in many different respects." Trump explained, "But I have tremendous respect for women. You see all of the women I have working around me and working with me. Tremendous respect for women." As excerpts from the interview -- particularly the president's take on feminism -- began making the rounds online, Morgan took to Twitter Sunday morning, writing, "Massive global outrage & mockery over President Trump telling me he’s not a feminist. Just imagine how much worse it would have been if he’d said he WAS."